Beloved Masters. I'm lost of which course to take in my life. I have been in a relationship for three years, and now we have a daughter of almost two years, but since she was born, my partner started to find trouble in everything my parents do, and they helped us a lot. It turns out that now the situation is at a critical point, the last visit of my parents in our house, they discussed, something that had not happened before, and my companion is saying that goes away with my daughter if my father returns to our house. I have a great love for my parents, and I did not want it to happen, but I do not see myself far from my daughter, my wife missed things she did, but she can not see it, my father was wrong about what she said on that visit, but Now they will not visit me, and if I go and visit them she'll fight and try to leave. I'm lost, because I love my parents, but it's also going to be difficult to leave my daughter, I like my partner too, but she does not understand the things she did. Beloved son. 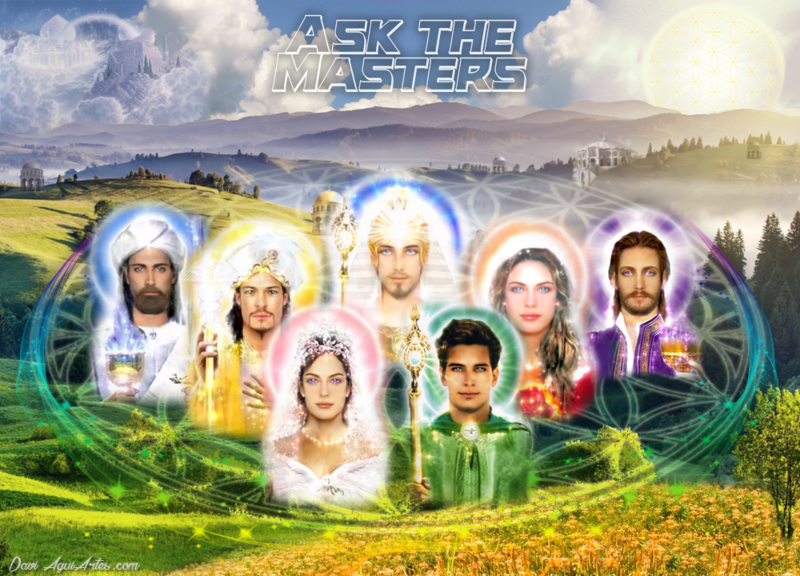 I am Master Saint Germain, and I am radiating the flame of transformation that will help you to work the energies that are present in your life. Realize that you are inserted in the situation, as it seeks to resolve conflicts by engaging in situations of relationships that are not linked to you, son. As you observe conflicting situations in your life, allow the people involved to react the way they are prepared to react by expressing their feelings to the outside in the way they have learned. It may often seem to you that certain ways of reacting, speaking, and discussing other people are wrong. But understand that each person is inserted in the reality itself, and each one follows in the way of learning the form that is necessary for the own evolution. Some people, dear brother, need to shed tears, to appeal to painful situations in the experiences of life, so that they awaken in their hearts the feeling that will make them free themselves from illusion, and give themselves to love and heart. The quest to understand and try to get people to look at situations from their point of view is something that will not succeed, son. For each creates reality in one's own mind in the way the heart feels and experience manifests through one's emotions. So, dear child, realize that when you take on situations, when you give your opinion, you are interfering in the free will of the people, who have their individual processes to live and learn. Just stay right now living your life in peace, let people come to you, whether to talk, to live, but just to respect and allow the events to occur naturally, without forcing situations. All the people in the family circle have situations that are worked on in the coexistence, from the constraints of the past. And each one, in due time, will make the cleansing and healing of all the aspects so that it continues happy and free. Just allow it to occur naturally, and remember that you are only in a temporary state living as characters in a family to bring the necessary learning to release you from the restraints you brought with you from old experiences. Not exactly your father, or your partner and daughter, but there are spirits, beings, who are united in this experience to learn from each other. By looking from this point of view, you will realize that the way to keep yourself happy is to allow the flow to occur naturally without interfering with the experiences in the way they present themselves. Does loving your daughter make you happy? So stay happy and love her, continue with her present in your life, son. Does loving your partner make you happy? So just be happy. Being with your father makes you happy? So visit your father and be happy. Just realize that just as you can and should do what makes you happy, son, everyone around you can and should do the same in your own lives. Go in peace, son, and so let the transmutation of each's restrictions occur at the right time, without suffering. Stay in peace. Dear Masters. I have sought incessantly to keep my mind and heart turned to the Mighty I Am Presence, yet I feel weak in a few moments. I have a wonderful son, whom I deeply love and who faces sequelae acquired at the time of childbirth. I can not understand why. I fully agree that each of us is the creator of his own reality, but in this case, I feel in my heart that I should not accept this condition. I have seven brothers, each of whom has two or three children. Everyone enjoys the grace of seeing their children progress and develop smoothly. I have several friends of long years, all of whom also have two children, at my age, without any limitation. Why does my only child have to go through this? I can not believe that my husband and I have created such a different reality for us, especially harming the most beloved person. I feel deep in my heart that I should not simply accept this condition. Please, I need a clear and direct answer to the following question: How to conquer the greatest wealth in this life, to see my son overcome all his difficulties and live fully and happily? With gratitude. Daughter. Among so many you were chosen to accompany the journey of overcoming and releasing a great spirit, your son. You, beloved daughter, do not realize that it was not you and your husband who created the reality of this child, but only you chose to be part of that journey, which is not limited to only this incarnation, but which extends through various experiences which have been Living and accumulating constraints that are now transmuted. Your son, as well as your husband and you, have chosen to be here at this time so that one can give the necessary support to the other in a way that evolves mutually. The learning of the overcoming that is brought to you, where you observe other families with children going through less difficulties, is the walk you have chosen for yourself during this experience, but it is happening exactly as planned. Realize my daughter, that everything that is presented in your life, comes to contribute to overcoming something that you can not understand because it is in the past. But that is recorded in his records, and reverberates here in this incarnation of different forms, such as emotions, personality and behavior. Therefore, my dear, just accept that divine wisdom is present in all your experiences. And that those experiences that you perceive today as painful and suffered from the one you love are actually perfectly planned to be part of his life, so that he can be released from the restrictions that came in this life. Realize that the way experiences are presented to a mother who loves her child may seem unfair, but when viewed from the standpoint of eternal life, she may understand that they are necessary for his or her evolution. You, my dear, are there playing your loving role as a mother, but you're just a character you've decided to incorporate to bring a light and sweet life to your child in the face of the experiences he's chosen to face. Follow in peace, offering the love and support of mother. And allow experiences to come forward to contribute to the learning and release of that spirit that is your child. Be at peace, my dear. WHY DO WE FEEL WORSE AND PAINFUL WITH FINANCIAL AND PROFESSIONAL DIFFICULTIES? Good morning beloved Masters, gratitude! Since I got married (seven years ago), my husband and I went through a lot of financial and professional difficulties. We are sick and worn out because of it. Are there any karma surrounding us? Can we do anything to change this? At that moment, we have two professional possibilities: the food branch (which we are now, despite not being remediating) and the branch of clothing (something new that we would initiate). What should we invest in? Is there any other possibility for us to overcome this moment? Once again, thank you for this moment. My daughter. All the answers are within you. I will direct the way for you to find the answer of your heart: Do you feel love for the work you do? Will the pursuit of a new activity benefit your heart? Will it bring you more peace and joy in your day? Will the work make you carry your love in the activity you do? While looking for an answer to the solution of the problems, do you realize how much you are involved in the fear of lack and restraint? Realize my daughter, that when performing an activity putting there the main ingredient "love", you will always be happy. What makes sickness and fear appear is precisely the search to fill the life of guarantees that the necessary material will not be lacking. The pursuit of happiness in the activity it performs is part of the lives of so many. But many can not hear the voice of the heart. That calls to show that everything you do with love and without expecting return, will yield many fruits. There is no material restraint and there is also no restraint when we give our time to love. Therefore, my dear, consult the oracle of your heart to find out what activity you can perform with love. No waiting for feedback. When you find out, follow faith on this path. For in him you will find abundance of all forms. Often the door may seem narrow, but it is only the illusion of matter to test you and show you must follow the call of the heart. When you listen to him, fear will overcome, and you will receive the laurels of victory as you find happiness in your work and abundance in your life. Many of you, daughter, think you need to change activity to learn to give love in what you do. But learning is just about learning how to take love in everything you do wherever you are. The point is: if you are not prepared to face the challenge of inner transformation and bring love into the activity you perform, choose the lighter path. That it will promote learning, but not inner transformation. So my dear, choose the path where you can give your love. And work within yourself the restrictions that keep you from carrying this love in the activities you perform. Thus will he work his healing, his evolution, and will follow the purpose to which he came in this incarnation. Be at peace my daughter. HOW TO BREAK THE CYCLE OF SUFFERING BETWEEN GENERATIONS? Good morning, Peace, Light and Gratitude. I am grateful for all the blessings I receive. But maybe I'm not enough, my heart trusts, but my head conflicts. My parents disembodied when I was young. Of the women closest to me, including my mother, they have always had troubled relationships, including me. Now, my daughter, you are having a relationship that makes you suffer, and that I think (but who I am) is not the best. It's a pattern repeated for generations, and I, I'm afraid. Someone told me that my daughter, is my mother reincarnated and came to complete her previous suffering. Am I going to lose her? I'm even embarrassed to ask these questions. I have tried to listen to my US, try to listen, but the head has more strength. I give up easily everything I set out to do for myself, not for others. The only thing I apply more is to do Reiki, but still lately ... Grateful. My dear daughter. It is not by chance that you have the blessing of working with Reiki energy. By working it on yourself, it brings healing and treatment to your entire family constellation. Her mother was only a character who incarnated in this family nucleus, because there she would have the opportunity to work in herself the liberation and healing of the restrictions that she brought from previous incarnations. So it is with you, your daughter, and all the other family members who have chosen to be part of this family nucleus, so that you can work out the specific restrictions that will let you loose from the matrix of planetary suffering. I brought you the Reiki energy, so that through union with the Family Constellation work, I can bring healing to this whole group. This is her quest to bring healing to herself as well as to all who are bound to the same cosmic record. Realize, dear daughter, that Reiki energy is present in all the healing work you desire, and that you can work it by uniting the energies and techniques to bring more possibilities of treatment. And so you will. The Reiki energy works not only the incarnate physical dimension, but it acts in all dimensions and akashic records, which will enable the treatment and healing of the restrictions of your family nucleus including those who are disembodied and those who are incarnated. Those that are in upper or lower dimensions. Reiki energy is multidimensional and coupled with other techniques such as the Family Constellation and Reading Akashic Records, will enable healing and treatment of these restrictions through only one representative of that family nucleus, which is yourself. In your hands is healing. In your hands is the Reiki energy. Good morning beloved Masters! Throughout my life I have been looking for answers about my affective life with people connected to spirituality through the game of tarot, healers and trying to hear the voice of my heart. In the last two relationships I heard that I had found the person "of my life" and one day even a gypsy asked me to talk to me and said that it was very necessary to give me a message from his spirit guide to say that the person in question was The man of my fate, and that we would be very happy. I believed every word, but watched my partner's actions and saw that it did not match what I had heard. I am afraid to believe in fantasies, because it is very good to hear what I hear, but I am lost, because some things really happen, some do not, and when it comes to relationships they do not seem to happen and my heart always fills with hope. Help me to understand why I hear so much good about love and the person I am involved in, and then nothing to be as I wanted or even heard. I am practicing ho'oponopono with this person, to try to let this feeling flow, because it is being very difficult for me more this pain of liking someone and not being reciprocated. It hurts too much to believe in a feeling that does not flow, does not correspond. I do not know if the question would be correct, but I would like to know if the problem is in me and what would be the best way to change my life to reach this love so dreamed and expected. Gratitude Masters! My beloved sister. I would like to remind you that you are looking for happiness outside of yourself, looking for something to complete you, when in fact you do not need it. Doing so opens the door of lack of vigilance so that others tell you what to do and in doing so forget to feel the truth. What is inside you, my sister, is a pain that disturbs your true view of the situation. And by thinking that happiness will be found in a relationship, or in another person, closes to the truth of what is happening around you. To want, dear, is something that takes us from the true path of the heart, for it is not made from feeling, but from what the mind says is good for us. And then the way of the heart becomes darkened in this will. It's that you want so badly to find the perfect person that you forget that it's within you. You do not need to seek other people's opinions, but to learn to be good with yourself and then you will see that the best love will appear, but not because you wanted to, but because you no longer need it, you have learned to feel what you really need to love yourself . And when you have that certainty that love is within you nothing will affect you, for you will discover that it is enough for yourself, and then you may have a companion to divide your days without putting expectations of how it will be, how it will be treated, But just accepting that it will be fine while it lasts. But the day you stop being, you will be strong to follow your path with confidence and faith in life, because you will discover what is most important: the love that goes inside you. Be at peace, my sister. Dear and beloved Masters, good morning! I ask for your help, I am in financial difficulties and I need a quick solution, or I will go through even greater difficulties, where should I stay? What should I learn? Help me understand. Gratitude. Daughter. Do you realize how life is running against time? Do you see how he has not accepted to live his experiences in order to give himself entirely? Realize my beloved, how the silencing of the mind can help to listen to your heart. Breathe in and calm down. Seek the answer within you. For the answer is there. Realize that the more you look impatiently for the answers of life, the more you will feel lost. You can only find the answer when you give yourself enough time to silence and listen to your heart. It would be of no use, my beloved, to give you the ready answer to your life. For you are in a great hurry to hear us. It is not only through these channels that you can get the answer. But we are with you to try to communicate and direct your way, if you are willing to silence and calm down to hear us. Be involved in my love. Messengers: Thiago Strapasson and Michele Martini - April, 2017.